"Four Wishes" is a charter yacht whose ethnic interiors are full of oriental charm, but life on board is characterised by a touch of French chic. Cruising Area: Caribbean and Mediterranean. Tenders: 23 ft/7 metre Novurania w/260 HP stern drive; 14 ft/4.26 metre Novurania w/50 HP. Toys: 2 waverunners, parasail, 4 underwater scooters, water trampoline, assorted fishing gear, water skis, 4 bikes, golf clubs & driving mat w/floating balls. 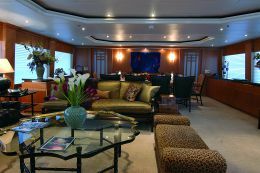 The extremely relaxing and elegant atmosphere is made up of many well chosen details which range from the interior design to the galley, to music and reading and golf. Let's visit this yacht with the reader, imagining we're going to choose it for a dream cruise. Going onto the stern deck we enter the living area, equipped with a bar at the sides of the entrance, and we proceed, perhaps with a fine drink in our hand. We immediately see the broadened and pleasant view of the saloon, furnished in ethnic style, tending to an Afro-Japanese fusion with Indian influences. On the left going in, the relaxation and conversation area opens up, formed by four sofas. Two of these are corner sofas with structure in carved wood complete with upholstery, covered with a golden fabric and with patterned cushions in gold and black. A fur stole folded like a blanket accentuates the welcoming atmosphere. The other two sofas are fully upholstered and are set facing each other. The one with backrests and armrests is covered in black fabric with golden motifs and has matching cushions edged with lots of tiny strasses. The one without a backrest is covered with a light-beige maculated design fabric. Two low linear tables in glass and metal, set at the sides of the sofas, bear several precious objects. In the centre, a large low table in glass and metal, of typically Indian design, bears a vase of flowers and offers plenty of space. Light metal structures are spread around on the furniture with a lot of lighted candles. The dining area is opposite the entrance, in front of the forward bulkhead. It communicates directly with the galley pantry to which access is gained by means of an electrically operated sliding door. The wooden dining table seats 12 on upholstered bamboo chairs covered in black fabric with small golden patterns. At the time of our visit the table was set for a refined lunch which would begin in less than a couple of hours. The tablecloth was made up of artistically overlaid lace and the napkin holders were in light and dark striated ivory. Plates, cutlery and glasses were laid out artistically and bottles of rare wines were already in place with a carefully rolled serviette. There was a miniature individual cruet set for each diner. Lastly, an extraordinary flower composition in the centre of the table captured our attention as we tried to grasp every detail of the set table on which, in intentional disorder, flower petals had been scattered. Every detail of the furnishings contributes to creating an evocative environment, full of taste, and the whole is extremely relaxing. 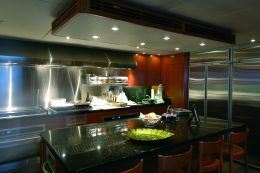 Quite another story in the galley where stainless steel and wood dominate and where we were struck by the perfect organisation and highly modern equipment. We found the cook at full steam ahead as, aided by a hostess, he manoeuvred with incredible speed and precision between the oven, where he slipped in a tray of skewered fish, the cooker where no less than three aluminium pans emitted curls of steam from boiling liquids, and a chopping board where he personally sliced washed potatoes and vegetables and prepared dessert moulds where freshly made muffins seemed to explode, showing the dark raisins as if they were sweet little projectiles that would at once strike the senses of taste, sight and smell. I paused to think that this boat is a dream and that the charter will be a spicy, strong and inebriating sensorial experience, such as only exotic atmospheres can give. Leaving the galley we come to the access area where there is a spiral staircase, a day-bathroom and the owner's cabin and study. In this area, on a low piece of furniture, there are four great Japanese ideograms in steel, the same ones that are found on the wall behind the chart table on the bridge, this time painted in gold on a dark background of four rectangular ceramic tiles. These signs, incomprehensible to us and vaguely mysterious, have a precise meaning, since they are the "Four Wishes" for which the yacht is named: Joy", "Prosperity", "Long life" and "Good Luck". In "Four Wishes" there's a subtle thread of meanings and suggestions that link the furnishings with a certain relaxed spirituality which slows down the frenetic rhythm of life and gives the yacht's guests a calm and propitiatory atmosphere which will always remain in their memory. 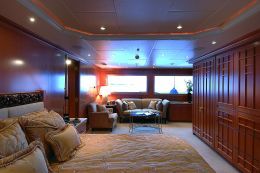 On the upper deck, external to the bridge, there is a relaxation area with table and sofas set in the bow structure of the vessel. Wholly suspended between sea and sky you can fully enjoy a holiday in the open air. When you've had enough of the sun you can go inside where you'll find, aft, a study and a second spacious saloon. The study has a wall-bookcase full of art and travel books, a desk with PC and a spacious sofa. In the access area there are curved glass shelves with floral decorations and, entering the saloon on the left, there is a long bar with a great lacquered counter and high stools covered in apricot coloured satin. In the relaxation area there are two sofas and two armchairs set around a large flat screen TV. The style here is more casual, with twisted woollen fabrics in colours ranging from orange to brown with touches of red and violet and with matching cushions and travel rugs. Whereas leaving the second deck aft we find absolute minimalism where a small table and four armchairs in basketwork stand out for their naked cubism. We leave "Four Wishes" while a pleasant aroma spreads through the air and two ladies, musicians, are preparing their music stands and sheet music in a corner to accompany the upcoming meal with their violins. The guests are about to arrive so it seems more than appropriate to add a fifth wish to the four we have already seen: "enjoy your lunch".